SWECHHA, A Delhi-based non-profit, has been running programmes to educate children belonging to the weaker sections of society for the past 15 years. Last year, it started a food-delivery service, called Lunchbox 17, in association with women living in Jagdamba camp, Sheikh Sarai, a slum area in South Delhi. ‘17’ denotes the postal code of Jagdamba camp. Getting home-made food is a major problem for Delhi’s vast working, migratory population, which does not have the time or resources to cook food at home. This has created a huge demand for home-delivered lunch box business in the city. Non-profits, small-scale start-ups and entrepreneurs have been joining the growing industry. “Our meals cost Rs 80-120, depending on whether the food is vegetarian or non-vegetarian,” says Sourabh Sengupta, head of operations, Lunchbox 17. “We have trained all our cooks to prepare food with minimum oil and spices and to maintain hygiene. The cooks wear chef hats and we make sure the kitchen is clean at all times,” he adds. Some tiffin services in the city have grown at a phenomenal rate. For instance, Calorie Smart, a Gurgaon-based company that delivers food exclusively to private companies, had only 10 customers in 2011. Today, the number has spiralled to over 800. They sell around 600 plates per day, with each plate costing Rs 100-200. Estimates suggest their monthly profit is easily over Rs 1 lakh. “We offer six types of cuisine— Chinese, Lebanese, Mexican, Indian, Italian and Thai. Each plate is set according to the calories one wants to consume,” says Dimple Chatterjee, director of sales and customer engagement, Calorie Smart. “The cost of some of our plates can go up to Rs 300,” she adds. Calorie Smart has a small team of 10, which includes cooks and helpers, and their monthly salary ranges from Rs 9,000 to Rs 14,000. 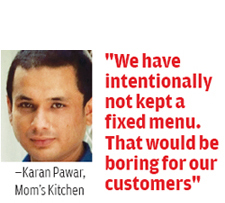 “Food business never faces recession,” says Karan Pawar, who has been running a home-cooked meal service, Mom’s Kitchen, in Ber Sarai near Jawaharlal Nehru University for the past three years. A graduate in hotel management from Chandigarh University, Karan says it took him three years to set up the business. He also supplies food to a paying guest hostel for boys, which helps him earn a good profit. 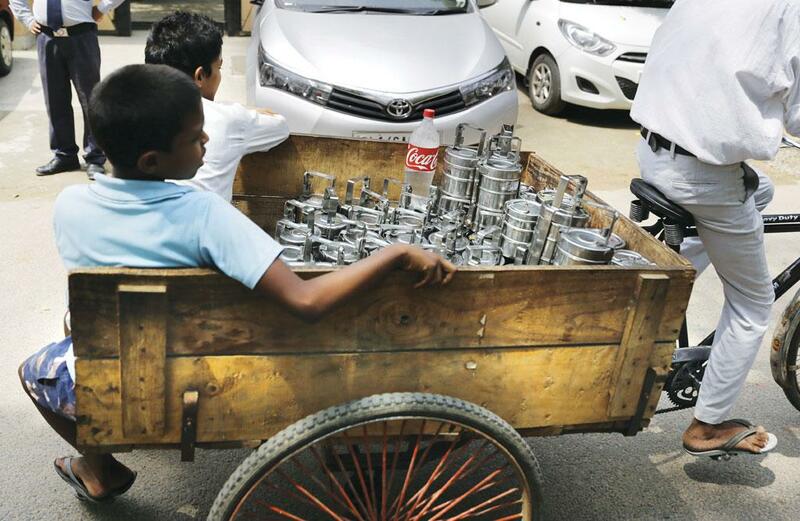 Another entrepreneur, Adarsh Jagarwad, who started AJ Tiffin Service Centre in Saket four months ago, says that the idea of starting a tiffin service occurred to him during his student days in Delhi. Jagarwad completed his graduation in technology from Rajasthan and moved to Delhi to join a coaching centre. “I was looking for a tiffin service for myself, but didn’t come across a satisfactory one,” he says. Although Jagarwad faced severe losses in the first month, today, he serves as many as 200 plates each day, and works with a team of seven. “As of now, my customers are only students, but I want to expand my business,” he says. Jagarwad made an initial investment of Rs 3-4 lakh and is now earning a profit of Rs 30,000 each month. “A minimum of three to four years is required in this business to start making profits,” says Nagendra Sharma, who started Delhi Tiffin Services from Shiv Nagar in West Delhi a few months ago. This holds true for Lunchbox 17 which is yet to start earning profit. It is managing to continue with the help of the British Council and Diageo, a London-based alcoholic beverage company. The NGO, however, is trying to find ways to increase its sales. Earlier this year, it launched a mobile app called Million Kitchen. “People can order food using this app. It has also enabled us to reach out to people across the city. 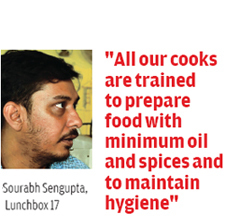 Some of our Lunchbox 17 cooks also work for Million Kitchen,” says Sengupta. Foodpanda, a food website, has put Lunchbox 17 in their listing and Sengupta says that it is a great gesture. “Foodpanda does not even charge us,” he says.